This week at the Game Developers Conference in San Francisco, Valve announced a series of changes coming soon to Steam. Foremost among them are an overhauled game library and an event system that can be used by developers to keep players clued in about what’s happening in games they own. 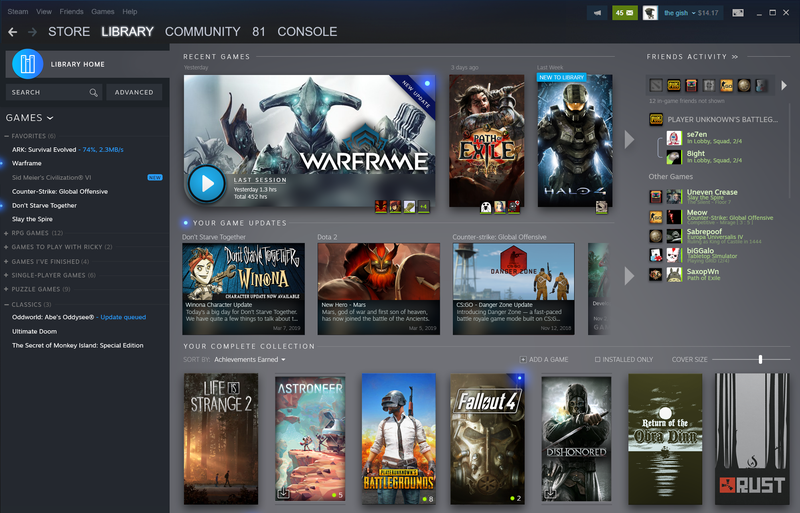 During a press pre-briefing on Tuesday, Alden Kroll from Valve described the library changes as a “complete redesign.” Users’ Steam libraries will soon have their own home page, not unlike the Steam store’s front page. That’s pictured above. The Steam library home page will have a carousel dedicated to game updates and events, to keep players clued in about what’s going on in their games. There will also be a widget dedicated to friend activity, allowing you to see what your pals (and/or lifelong nemeses) are up to in individual games. From there, you’ll be able to matchmake into games with them, if you want. Players will also soon be able to sort their games using the same tag system that the Steam store currently employs. Any games that fit the criteria for a specific collection—Kroll used open-world role-playing games as an example—will automatically be added to that collection, taking some of the hassle out of keeping your colossal game collection from bursting out of your figurative closet. The other big change coming to Steam in the near future is a robust event system designed, said Kroll, to improve Steam’s functionality in this era of “live service games.” Developers will be able to announce an event—say, a tournament, a major update, or a livestream of a big esports match—and players will be able to receive notifications via the method of their choosing. Players will also be able to set reminders about the events that can reach them by way of email, text message, phone notification, Google Calendar, or other options. This will all be bound together by an events home page that will be different for every user based on which games they have in their library. The page will have sections for recommended upcoming events, as well as “major” and “minor” ones, as shown below. Valve will provide developers with improved traffic measuring tools so they can see how many people are actually turning up for events—hopefully giving them a less fraught avenue toward keeping their player bases healthy and growing over time. I could see this being especially useful for smaller multiplayer games that wow people out of the gate with a clever idea, but quickly get lost in Steam’s endless churn of clockwork-engineered consumerism and lose large chunks of their player bases.